…and yet, when I consider what’s really important, I settle on the small things in life. 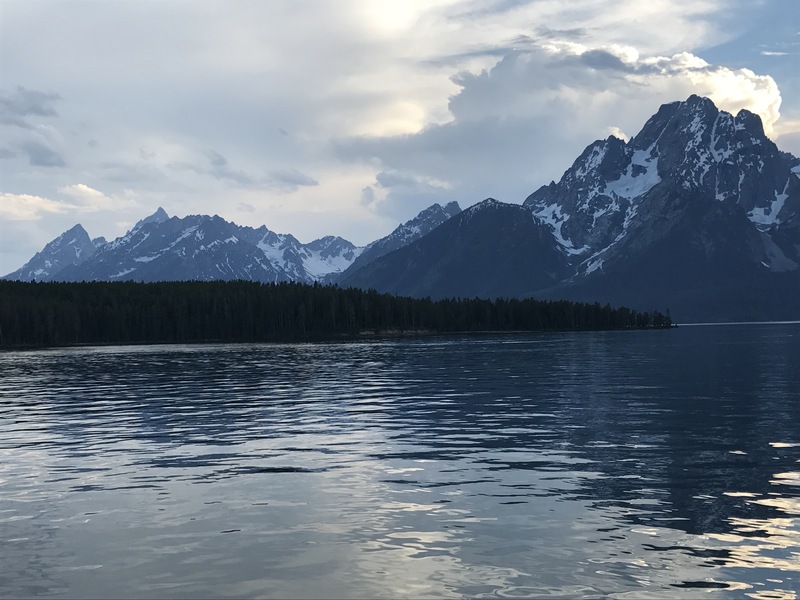 Last weekend my husband and I spent a relaxing Labor Day on Jackson Lake in Grand Teton National Park. The lake arguably has one of the most beautiful backdrops in the Lower 48 -the Teton range. Sunday morning, I decided to go out for a leisurely kayaking adventure from our “flotilla” of boats to explore the shoreline about 100 yards away. About 20 yards from shore I spotted him. There, perched on a dead tree was a huge bald eagle, looking down at the water – and what felt like directly at me. I put my paddle down and silently wished I had brought my iPhone on this little adventure. I watched as jetliners screamed overhead from north to south. I also remembered my flight attendant days when I would ask the Captain to alert me if we would pass over Jackson on our flight path. I would longingly gaze towards the earth from 35,000 feet – wishing I were at home, or on Jackson Lake taking in the beauty. Here I was. In the moment. On the lake. Soon the screeching of another bird, an osprey, awakened me from my trance. I was back in the moment on that shoreline. Now only 10 yards away, the enormous eagle lifted up and soon threw his whole body weight off that dead tree. He was being chased by the osprey! The two birds swooped down towards the water (and ME! ), made a sharp turn south and flew towards another stand of trees. I sat amazed, humbled and grateful. So grateful that I hadn’t been messing with my iPhone settings, grateful that I hadn’t tried to video that instant, but rather just took it in with my own eyes. I was able to keep my eye on the two and followed the eagle to another perch. Within a few short minutes, I heard a screech again, and here came the osprey, this time not following the illusive eagle, but rather diving into the water for lunch. He missed, but the thrill for me was enormous. I could almost have felt the splash of the water on my legs, outstretched in front of me on top of my lake kayak. Why do I write about experiences like this? To encourage others to take time to smell the roses. To look up. To be more situationally aware, and to be delighted by not only the people around you, but the places and things. And then try sharing them with others. I find that it makes me so much happier, more grateful and more delighted by the littlest things. 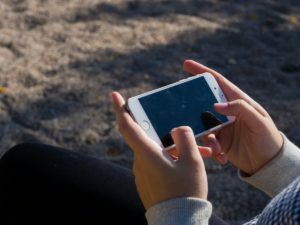 What does it take to truly connect with others? I’m not talking about “connecting” via a text message, a Tweet, or a photo on Instagram. Good question. Why should you care? What if it is to make a difference in someone else’s life? Maybe we should care because at the end of our lives, we could be like this woman. 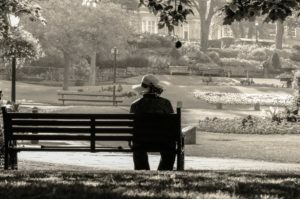 Alone on a park bench. Disconnected. I don’t want to be like this woman. “Then how do I go about connecting?”- you ask. Hear what others have to say. Listen to where they have been in their lives. The experiences they have had. Where could there be a common connection between the two of you? Do you have common interests? If not, does someone you know have a common interest to theirs? Listen, really listen to the person you meet. You might be amazed at what you find out. Once you listen to the person you are connecting with, learn more. Ask clarifying questions. “Did you say you grew up in Austin? So did I!”… or “Did you say you grew up in Denver? So did my father!”. Then ask more questions. Go back to step one. Listen to their answers… and learn more and more about your subject. Try to find that common thread and keep talking. Now is the fun part. Connect the dots. “So you went to Stanford? So did my mother! 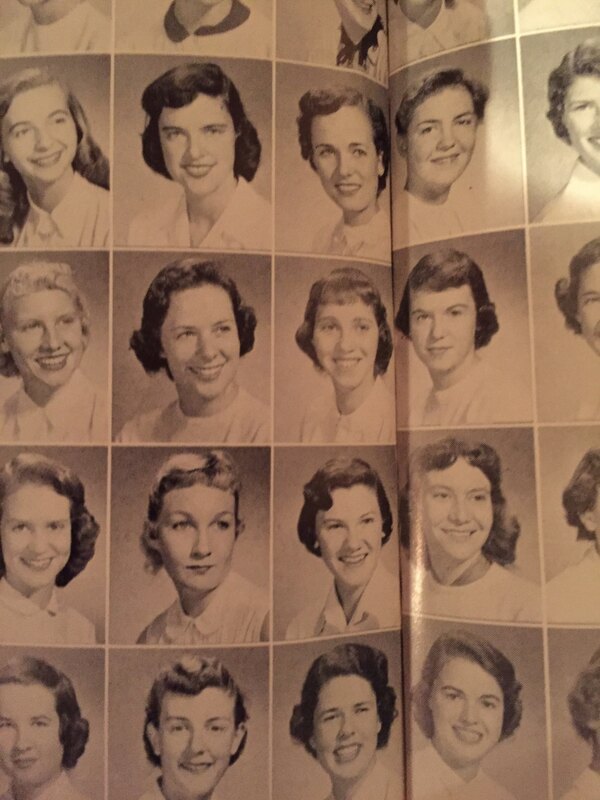 Mom was the class of 1956.” How amazing if you hear her say, “So was I!! !.” Follow through. My real world example of this happened recently. My sorority alumni association started delivering books to a local senior living center. We created a lending library for the residents. One particular woman was always at our “events”, dressed becomingly, obviously well-read, and interested in meeting others. She and I struck up a conversation one day. I learned that she had been in teacher in Jackson for many years. She loved to read and always selected several books to take to her apartment. Time after time when our group showed up at the residence, she would be there, anxious for the interaction and the new reading material. Guess what? So was Susan! And if you can believe this… I asked my sister to pull mom’s old yearbook off of the shelf at mom and dad’s house (mom passed away in 2014), and sure enough, guess who was in the yearbook… and not just in the yearbook, but on the SAME PAGE as my mother? Susan. A few weeks after my sister sent me some iPhone images from the 1956 Stanford Quad, I took an afternoon and set aside time to stop in and see Susan. She wasn’t expecting me. I wasn’t there on the day of our regular lending library event. Why did I take the time to connect with her? It wasn’t about me. It was to brighten someone else’s day. There is nothing like a human connection. We hugged after a chat and after I showed her an image of herself from 6 decades past. In this case, there are not 6 degrees of separation. Now there is one.